Stress is inevitable. But simply changing the way you react to daily stress could be the answer to fast and sustainable weight loss. Start with these 6 delicious teas, and check out The 7-Day Flat-Belly Tea Cleanse now to start losing weight through the magical powers of tea! 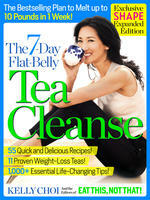 Melt up to 10 pounds in one week—while drinking tea and eating clean—with The 7-Day Flat-Belly Tea Cleanse, available now!